I’ve often referenced a ‘race plan’ in posts about preparing for and surviving race day. Several people have asked me what a race plan is, or if it’s the same thing as setting race goals. So I figured it was about time I dedicated a little more time to the idea of creating a race plan. I’m a planner and admittedly more than a little type-A, so race plans are right up my alley. There are few things I love more than a good checklist and to-do list. A race plan is part timetable, part goal setting/contemplation, part checklist, and part visualization. It’s your chance to plan ahead. To consider (and document) what you want to do on race day and what you have to do to make that happen. It will make sure that nothing is left up to chance on race day. You should consider and draft your race plan ASAP. The earlier the better. For marathons, draft your race plan at least 3 weeks out from your race (usually when your taper starts), although it’s better if the plan is initially drafted while you are still doing your longest long runs. That way, you can test parts of the plan during your long runs and revise the plan as needed. If you draft your race plan later and try to remember what issues arose, you may not remember. Your plan can take whatever form, and be to whatever level of detail, you want, but I have created a template to get you started. Your race plan helps you plan ahead, but it’s a living document that should be flexible as circumstances change. Your plan is not set in stone. If you’ve initially drafted your race plan early in training, review and revise it as your training progresses. Are your paces are better/worse than expected? Do you want to/need to fuel or hydrate more often? Should you adjust your morning timing? What issues came up during your long runs? Also, review and revise your race plan frequently in the last few days before the race. Do you know your race execution strategies and visualization cues by heart? You can include anything you want in your race plan. It should suit your individual needs, although I recommend the following items. What do you want to accomplish on race day? I recommend setting three goals for race day: A best case goal, a realistic goal, and a ‘things just aren’t going my way’ goal. That way, you’ll have a goal to shoot for, regardless of how race day turns out. However, I’ve heard people criticize that approach, suggesting if you have a ‘lesser goal’ you may not push yourself as hard as you could to accomplish a challenging goal. Know yourself and which approach is best for you. Set your race goals in a way that will inspire and focus you on race day. How, specifically, are you going to make your goal happen? What specific pace(s) are you going to run? Are you going to run a consist pace or start slow and speed up? Consider the topography of your course. Do you plan on adjusting your pace for hills (running a consistent effort)? Consider how you want to ensure proper hydration and fueling, both on the run, and in the days and hours leading up to the race. When do you want to eat your last main meal the day before your race? What should that last meal consist of? Are there any foods you need to remember to not eat or a time you don’t want to eat after? What should your breakfast be on race day? What fuel(s) do you want to consume? How often? What hydration(s) do you want to consume? How often? If you plan on using or entirely relying on aid stations for fueling and hydration (which I’d strongly recommend against, but that is a subject for a different post), compare your plan to the location of the aid stations. How well do they match up? 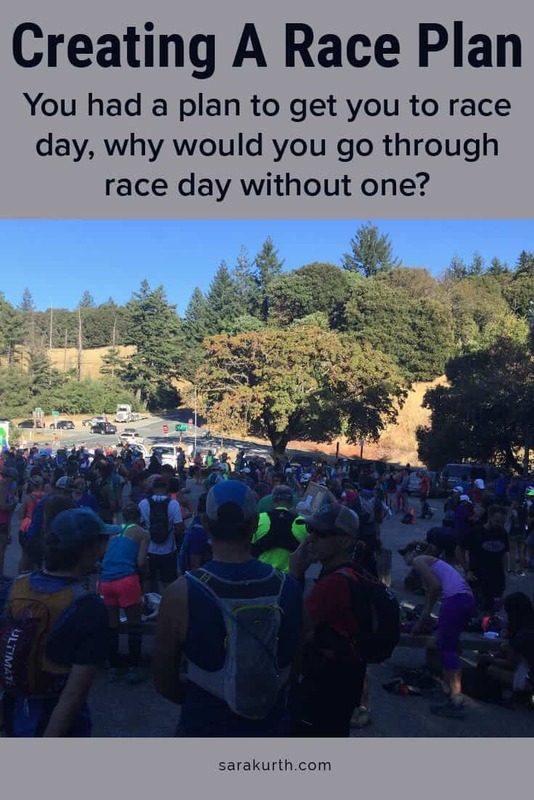 You don’t want race day to be the first time you do the math on when you should leave the house. During your training, test this timing and adjust the plan as needed. A packing list is especially important if you are traveling for a race. It is super easy to forget a key piece of gear. Do NOT rely entirely on your memory to remember everything on race day. Make a list and use that list when packing and/or setting gear aside in the days before the race. Practice using each of these mantras during training runs so they become second nature. Consider your long runs. What issues arose? Where did you struggle? How did you overcome those challenges? Consider what could happen on race day and what you will do to overcome those issues. Notice a hot spot in your shoe developing? Even if you write the most amazing plan ever, it will do you no good if you write it, stick it in a drawer and never think of it again. Visualize yourself nailing your race by following your plan. Visualize yourself overcoming any issues that arise on race day. What about you? 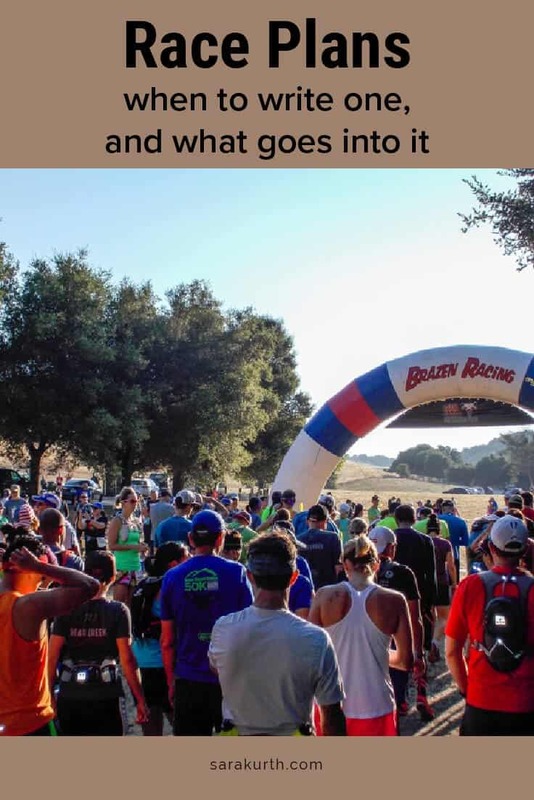 Have you ever used a race plan? Anything else you’d include?